On the strength of two one-goal victories, the cellar dwellers of the regular season, the Miami RedHawks have rediscovered their mojo and are moving on to compete in the first NCHC Frozen Faceoff in Minneapolis next weekend. We’ll have more later, but what you need to know is Miami will be joined by former CCHA and MAC mate Western Michigan and Jim Montgomery’s Pioneers of the University of Denver. Each of those schools was the underdog going into the weekend. With North Dakota and Colorado College heading to a decisive third game tomorrow night, it is conceivable that all four lower seeds could advance. If North Dakota wins, Miami will face the team formerly called the Fighting Sioux. If CC pulls it out, Miami will face Western Michigan in one semifinal. 2013-14 may go down as one of the largest disappointments in the history of the Miami hockey program. As crushing as the 2009 Frozen Four turned out, it was the turning point for the program, and created our new “all or nothing” mindset and expectations for the Miami University Hockey team. Since then, if Miami doesn’t win a regular season championship, tournament championship or even an NCAA Regional championship, it seems that the season is a loss. Well…we’re not going to get any of the three this year unless the team goes on an unbelievable run in the next 2 weeks. Miami’s last losing season was 9 years ago. In the 2004-05 campaign, Miami went 15-18-5. Miami has made the NCAA tournament 8 consecutive years and 9 of the last 10. The streak ends this year unless Miami wins 2 of 3 vs St. 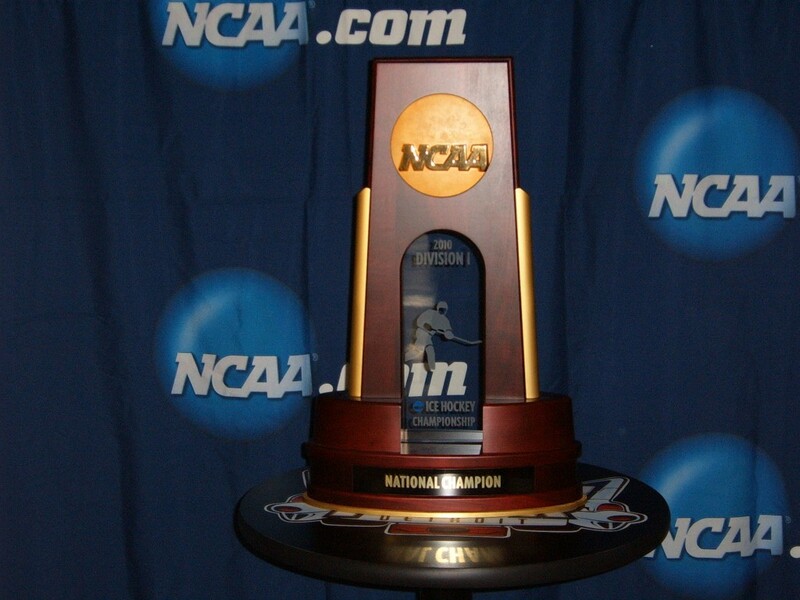 Cloud and then wins the Frozen Faceoff – the NCHC’s post season tournament. Michigan’s 22-year NCAA tournament appearance streak was the longest in history (lasted every year since 1990!) and North Dakota looks poised to continue its streak this season, making it 12 years in a row – now the longest in the NCAA. In those last 8 years with NCAA tournament appearances, Miami has 3 CCHA regular season championships, 1 CCHA tournament championship, played in 2 frozen fours, had their first-ever Hobey Baker winner and compiled the best record in the NCAA with a total of 207 wins – an average over 25 wins a season. Before this run started in 2005, Miami had just 2 seasons of 25+ wins – 1996-97 and 1992-93. Miami’s winning percentage heading into conference tournament play is just .397. The last time it was that low as Coach Blasi’s 3rd year in Oxford – the 2001-02 season saw Miami go 12-22-2 – a .361 win %. In order to make the post season, Miami must win 4 games in a row – something they haven’t done this season. In the last 8 years, Miami has had 21 4-game winning streaks without ties or shootout wins including 5 times in 2007-08, twice in 2012-13 and a 13-game unbeaten streak (3 ties) in 2010-11. Miami won just 6 conference games in the NCHC this year. To find the last time they won that few conference games we have to go back to the 1990-91 season when Miami won just 5 games all year, 3 of them coming in CCHA play. In fact they have only won that few conference games twice, with 1985-86 being the other time (also 3 CCHA wins). Accoring to the College Hockey Historical Archives, the last time Miami finished last in a conference was the 1990-91 season as well. It doesn’t get much worse for Miami. But all is not lost. Yet. Miami won 2 of their 6 conference games against St Cloud State, and the Huskies are a team that they are becoming very familiar with. The two teams played 3 times in the 2010-11 season and met in the NCAA regional final last season, with St Cloud taking a 4-1 victory, making their first-ever Frozen Four appearance. Miami faces off against SCSU on Friday and Saturday night this week in St. Cloud. If the teams split the first two, the rubber match is on Sunday for a chance to play in the Frozen Faceoff in Minneapolis next week.